Genomic imprinting is a normal process found in plants and mammals. Imprinted genes are characterised by expression that is dependent on the parental-origin of the gene such that one of the two copies is expressed – either the maternally inherited copy or the paternally inherited copy. It is well-established that the regulation of activity and repression at imprinted domains is conferred by acquisition of DNA methylation at CG dinucleotides in eggs and sperm, which differentially marks the maternal and paternal chromosome homologues and influences gene expression after fertilisation. Differential histone modifications have also been identified at imprinted domains. Recently, the genome-wide distribution of several histone modifications has been described in mammalian cells. 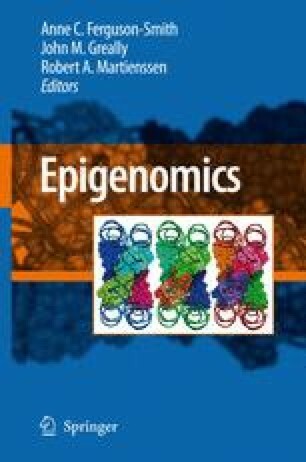 Here we extract this histone modification data specifically for imprinted domains and assess the extent to which regional modification might provide insight into the epigenetic control of gene activity and repression in mammals, and the functional relationship between histone modifications and DNA methylation at imprinted loci.